The Gambler is a film that I’ve been following for awhile now. It’s based on the 1974 film of the same name, which stared James Caan and was the first screenplay credit by James Toback. I’ve never seen the original, so I didn’t have any bias going into today’s screening on Christmas Day. At one point Martin Scorsese was set to direct the remake with Leonardo DiCaprio, which would have reunited both with William Monahan, who wrote The Departed and wrote this remake. That fell through as Scorsese and DiCaprio went on to make The Wolf of Wall Street. Mark Wahlberg and Rupert Wyatt, director of 2011’s Rise of the Planet of the Apes, came in to replace them and they were able to finish the film in time for the end of the year. There has been a little bit of Oscar buzz for Wahlberg in this role, as the actor lost 60 lbs to play this role, because apparently that’s how you win Oscars nowadays (It worked wonders for McConaughey). Here’s my review of The Gambler. Mark Wahlberg plays Jim Bennett, a failed author who is now an associate professor at a college in Los Angeles. His father has just died, and he’s been given a little bit of cash because of it. 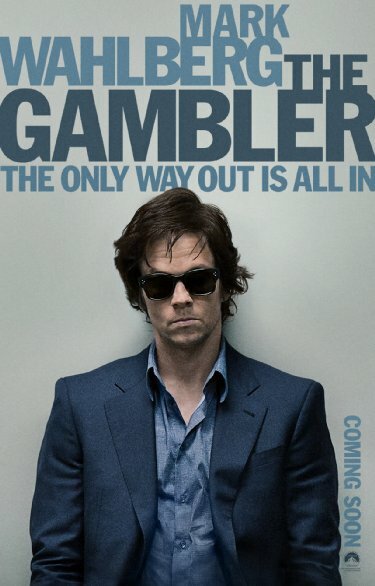 The problem is that Jim is a gambler, hence the title of the film. He doesn’t casually go gamble in tiny casinos in the state of California. He does some very serious underground gambling type stuff, and he gets mixed in with the Asian mafia (I don’t remember which region of Asia so I’m trying to be as politically correct as I can), as well as some small time crooks in the characters played by Michael K. Williams and John Goodman in a small but memorable role. He also has to juggle his relationship with his mother, played by Jessica Lange, and a possible relationship with a student of his, played by Brie Larson. As I mentioned before, Wyatt directs a script by William Monahan, who won an Oscar for writing The Departed, which was a remake of the beloved Hong Kong film Internal Affairs. What also got my hopes up during the credits was that James Toback was an executive producer on the film. This shocked me because I remember Toback was pissed that Scorsese was developing this film a couple of years back, and the very outspoken screenwriter went to the press to let loose his anger. But I guess he’s warmed to the idea, and he’s been doing press for the film. The original producer of the original film, Irwin Winkler, one of the greatest film producers of all time (produced all the Rocky films as well as Goodfellas and Raging Bull) produced this remake. That got me excited, and for the most part I was impressed with The Gambler. I can’t say that its a great movie, as it does have some pacing issues from time to time, but its a very solid and slick Hollywood thriller, and it feels a little more a commercial film rather than a prestige piece, which isn’t a bad thing. Mark Wahlberg is really terrific in this role. We’re use to seeing Wahlberg play these tough guy roles who crack some jokes here and there but for the most part retain a very serious tone throughout the film. This is a very different role for Wahlberg. He doesn’t play tough at all during the film. A vibe that I kept getting was that the character of Jim in the film was sort of less funny/sympathetic/talented Hank Moody from Californication. The character still retains a similar screw-up quality to Hank. I’m still not entirely sure why Wahlberg lost all that weight, but maybe it made him seem less tough or threatening. Because the character is a screw up that never really learns his lesson and is always getting into trouble with the wrong kind of people. I’m not gonna say that Wahlberg deserves any awards consideration for his work in the film, but it’s still a great performance, and one of the very best of his career. Jessica Lange is also fantastic with the little screen time she’s given as Jim’s mother. Lange is one of our finest actors whose ever graced the screen (I still haven’t seen American Horror Story, which I should since she’s always winning Emmy’s and Golden Globes for the show), so it’s always great to see an actress of her caliber in a studio film like this. Brie Larson also does some great work here as Wahlberg’s love interest, and its great that she’s getting more and more roles in bigger movies. I feel that she’s going to explode big time in the future, and hopefully that’s not too long down the line. Michael K. Williams, whom many of you may remember for his work on the HBO shows The Wire and Boardwalk Empire (as well as being a native Texan) is really great as this slimy gangster. He chews up the scenery in almost every frame he’s in. He’s a great actor, and it’s great to see him get some film work outside of his television work. And of course, John Goodman steals every scene he’s in as another gangster, who is both very funny and a little scary at times. Goodman is a man with no introduction for his talents, so ’nuff said. December 26, 2014 in 2014 Film Reviews, Movie Reviews.